Bonjour! I can't believe that I haven't written a blog post since July... and it's DECEMBER! I have been a little bit busy since then, what with having a baby and taking care of said baby. Baby Leah is 4 months old, and I am so excited that I have started to be able to get back into the swing of things on TPT, and now my blog! I am not back at work yet, but I am going back soon! Leah's dad is going to be taking over parental leave after Christmas, and I am really excited to be going back to school. I don't know about you, but when January arrives in the classroom, I am suddenly all about WINTER! I have been thinking about and preparing some of my favourite winter resources, and I thought I might as well hop on here while Leah naps and share some of them with you! Most of them are freebies, but I have included a couple of my most-used paid favourites as well. I love these guys - they are perfect for math centres! Your students will put together the number word, symbol, and correct amount of winter objects to complete each puzzle. You could even use them as a quick evaluation activity for counting and ability to match each number to its quantity. Okay, this resource technically comes from an English seller, but the beauty of numbers is that they share the same symbols in both English and French! This adorable little centre uses only symbols and no words, so you can easily integrate it into your French math centres. These ones are mine, so I am a little partial to them, and they are not free, however... I find them super useful! They are NO PREP, which we all sometimes need, and are fantastic to leave for a sub. They also give students some solid practice of important skills on those stormy days when only half your class shows up. And I don't know about you, but my students always need a little extra fine motor practice, and I try and fit it in however I can. Students will be cutting and pasting along with working on their math skills while filling out these sheets - a perfect combo! This little emergent reader is perfect for beginners, with a repetitive structure and important winter vocabulary. Your students will love colouring in the pictures! This reader is perfect for your students who are ready to take it up a notch. They will need to write in the correct word to complete the sentence on each page. There is a picture clue, and also a word bank at the end. I love the adorable froggy theme and how the trickier task of filling in the words is balanced out with the really simple sentence structure on each page. In her winter blog post, Madame Belle Feuille provides a great template for creating a class collaborative book about playing outside in winter. She actually also has some other little free mini books about winter in other blog posts, as well - just type "hiver" into the search to find them. This reader may not be free, but it is well worth the price. Lucy from For French Immersion has included 2 versions of her emergent reader (one where students practice the sight word hiver and one where they practice reading comprehension), as well as a big version of the book to read as a class. Having a class book included that is easy for my students to see and read as we practice together is a huge bonus in my opinion! 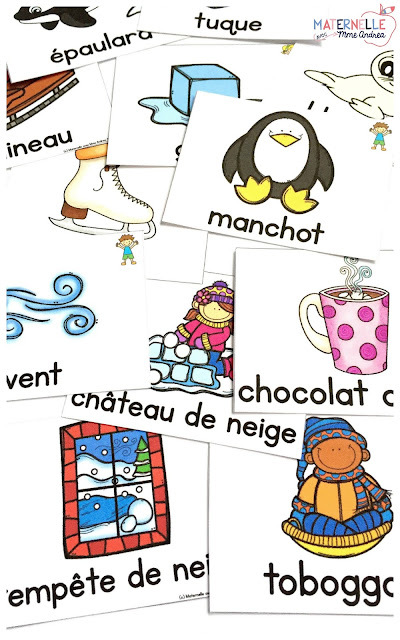 I like to print these posters and use them to help teach my students the names of their favourite winter activities in French. You can also use them to play charades, which is always a huge hit and great way to encourage your kiddos to use their new vocabulary knowledge! Another great set of free vocabulary cards, these ones are a good size for your word wall or writing centre. While not originally made with kinders in mind, I think that this activity would work really well in kindergarten or first grade, with a few adjustments! You would say a silly winter sentence, and your students would draw it as best they can. A quick and easy way to assess understanding of common winter vocabulary! My winter vocabulary cards set contains 44 winter words - a wide range of winter activities, animals, clothing, objects, and sports. They are a great size to use on your word wall, for your writing centre, as mini vocabulary books, reference sheets, personal dictionaries, for oral communication games, and more. Each card comes in colour and black & white. We use these all winter long in my classroom!! 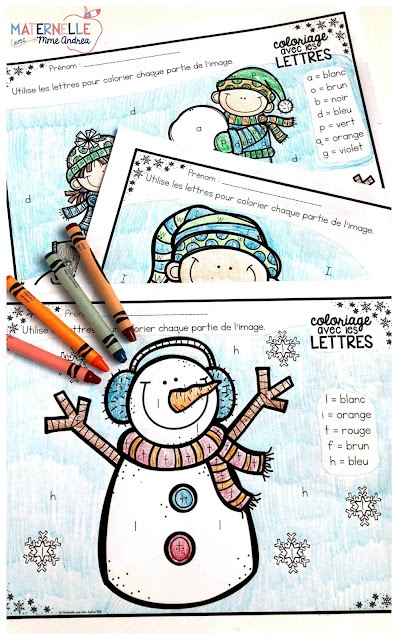 This is a cute, fun, and unique activity to help your students practice winter clothing vocabulary AND colours in French. It is a kind of roll and colour game and is super engaging - your students will all end up with different results depending on what they roll! 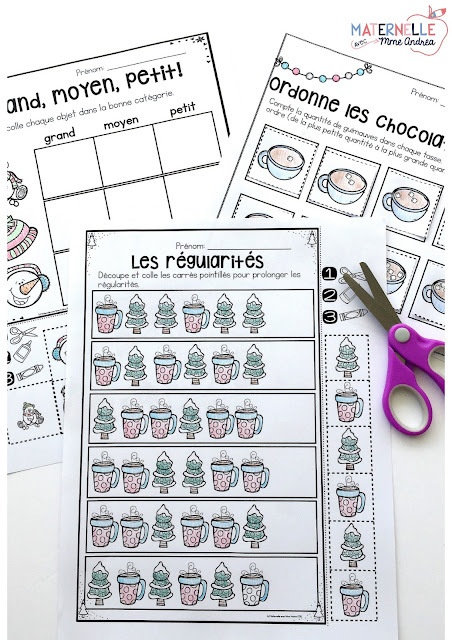 Another fun one by For French Immersion, this activity will have your students practicing sight words and reading as they unscramble the six winter sentences. Perfect for your fine motor centre, these cute tracing cards are easy to prep and fun for your students to use. They can use a white board marker on the laminated cards to trace the path and get the winter athletes back to the chalet. My students love these every year - they must use the code to colour the picture with the correct colours. A fun way for students to practice differentiating between letters that look similar! I hope that you enjoyed this post and that some (or all!) of these resources will be useful to you and find their way into your classroom this winter. 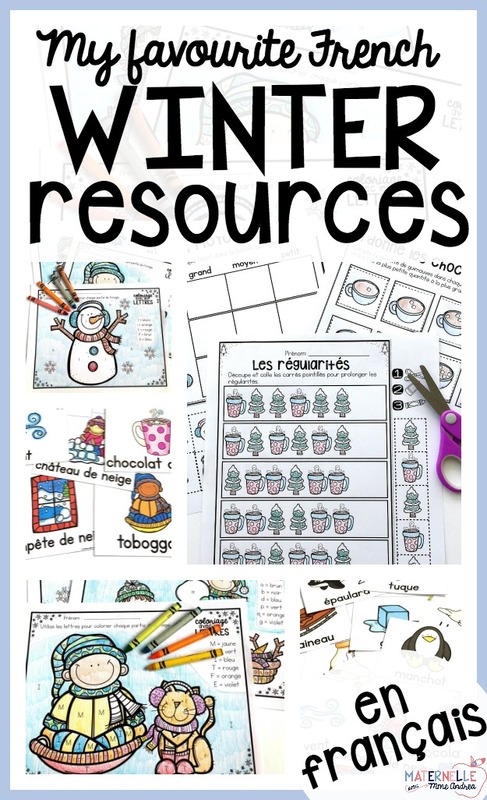 Do you have any other favourite French winter resources? Let me know in the comments!